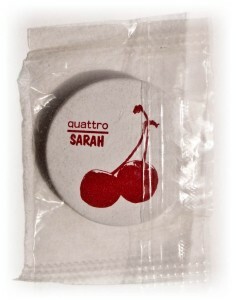 These were badges produced by Quattro, the label to which we were licensed for a while in Japan, and we would have been given them when Heavenly toured there in October 1992, visiting Tokyo, Nagoya and Osaka. I’ve not taken it out of its wrapper, as obviously that would make it worth less on eBay, but I realise that this actually makes it look a bit like a condom. Sorry.